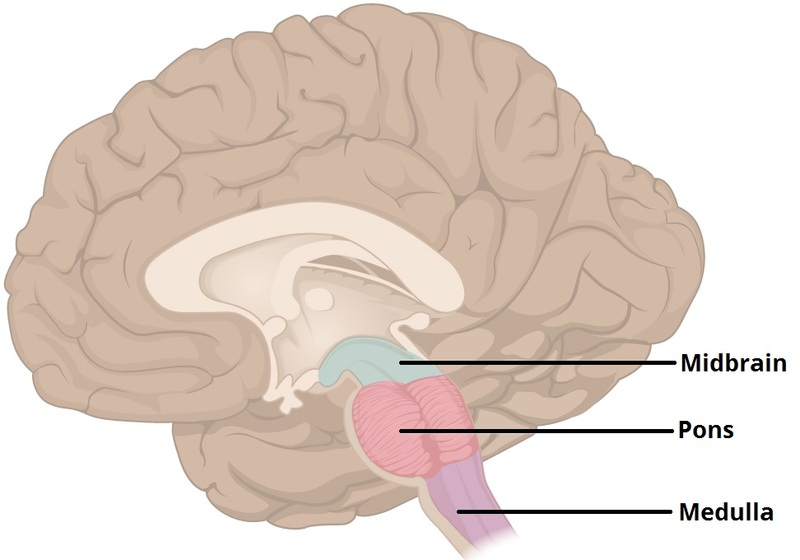 The pons is the largest part of the brainstem, located above the medulla and below the midbrain. It is a group of nerves that function as a connection between the cerebrum and cerebellum (pons is Latin for bridge). The pons develops from the embryonic metencephalon (part of the hindbrain, developed from the rhombencephalon), alongside the cerebellum. In this article, we will look at the anatomy of the pons – its location, structure and function, blood supply and clinical relevance. The pons is a horseshoe-shaped collection of nerve fibres located in the anterior part of the posterior cranial fossa. Posteriorly – the cerebellum, separated by the fourth ventricle. 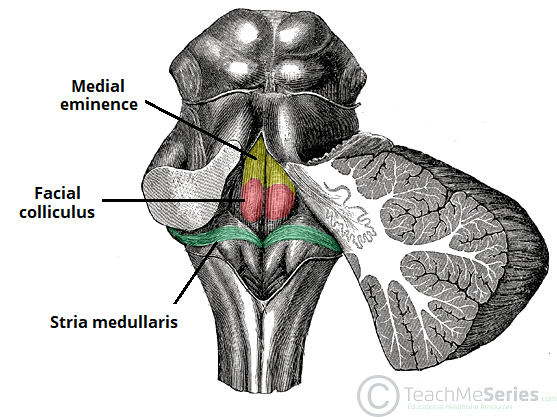 Inferiorly – the medulla oblongata. Superiorly – the midbrain lies immediately above the pons. The anterior or ventral surface of the pons is marked by a bulging formed by the transverse pontocerebellar fibers. These fibers wrap around the otherwise vertically oriented brainstem. It measures around 2.5 cm in adults. The basilar groove demarcates the midline of the ventral surface and is where the basilar artery is located. The pontomedullary junction is an important anatomical landmark defined by the angle between the lower border of the pons and the superior border of the medulla. Cranial nerve VII: facial – originates from the cerebellopontine angle, the more lateral aspect of the pontomedullary junction. Cranial nerve VIII: vestibulocochlear – originates laterally to the facial nerve. Fig 2 – Ventral (anterior) surface of the pons. The pons is intimately related to the cerebellum, and is connected to it by the middle cerebellar peduncles. Removal of the cerebellum will reveal the underlying fourth ventricle. The medial eminence marks the midline of the floor. The facial colliculus is a bulging formed by the fibers of the facial nerve looping around the abducens nucleus. The stria medullaris of the fourth ventricle is a bundle of nerve fibers crossing transversely from the lateral aspect into the midline. They mark the posterior border between the pons and the medulla. The angle formed at the junction of the pons, medulla, and cerebellum is another anatomical landmark and is named cerebellopontine angle. Here, the cerebellar flocculus, the ventricular choroid plexus and the emerging CNs VII and VIII surround the lateral apertures of the fourth ventricle (the foramen of Luschka). Fig 3 – Dorsal (posterior) surface of the pons. The pons is comprised of two major components – the ventral pons and the tegmentum. The ventral pons contains the pontine nuclei, which are responsible for coordinating movement. Fibers from the pontine nuclei cross the midline, and form the middle cerebellar peduncles on their way to the cerebellum. The tegmentum is the evolutionarily older part of the pons which forms part of the reticular formation – a set of nuclei found throughout the brainstem that are responsible for arousal and attentiveness. Damage to this part of the pons may result in anosognosia for hemiplegia, where patients are unaware of their paralysis. Descending corticospinal tracts – responsible for voluntary motor control of the body. Descending corticobulbar tracts – responsible for voluntary motor control of face, head and neck. Ascending medial lemniscus tracts – responsible for fine touch, vibration and proprioception. The pons houses important cranial nerve nuclei. Spinal trigeminal nucleus – extends caudally towards the medulla. Mesencephalic nucleus – extends rostrally all the way to the midbrain. 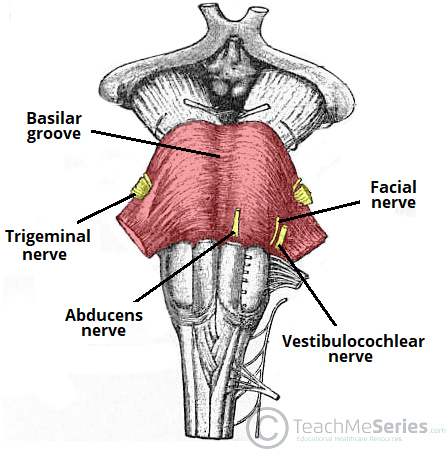 The abducens nucleus controls the abducens nerve, which innervates the ipsilateral lateral rectus muscle. It is located in the caudal pons, on the medial aspect of its dorsal surface. At the same level of the abducens nucleus, the facial nucleus is located more anteriorly and laterally. 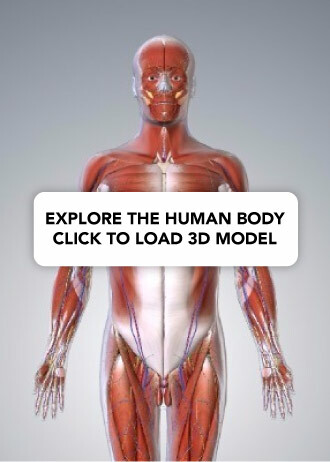 It controls the muscles of facial expression. Its fibers take an unusual course and loop around the abducens nucleus before exiting the brainstem through its ventrolateral surface. The cochlear and vestibular nuclei sit dorsolaterally from the inferior pons to the superior medulla. A smaller part of its blood supply comes from the anterior inferior cerebellar artery and the superior cerebellar artery (AICA and SCA). The venous drainage of the pons consists of the anterior pontomesencephalic vein, which drains superiorly into the basal vein, that in turn drains into the cerebral veins. Inferiorly, the pons drains into the inferior petrosal sinus, which drains into the internal jugular veins. The cerebellopontine angle is clinically important since it is often the place of intracranial growths, which can lead to impairment of nearby structures. Symptoms start with mild impairment of the cranial nerve in the area (CN VIII). Vestibular schwannomas (also called Acoustic Neuromas, although this terminology is incorrect since these tumours originate in Schwann cells, not in neurons, and usually on the vestibular component of the nerve) are the most common growth in the area. Similar to most primary intracranial tumours, they are benign and complications arise mostly from compression of nearby structures. They are slowly growing and are frequently related to slowly progressing ipsilateral hearing loss. Although vestibular schwannomas are responsible for roughly 80% of the cases, other causes can range from different tumors (e.g. menangiomas) to vascular abnormalities. Surgical resection guarantees a very good outcome in most cases, with the risk of complications increasing as the size of the tumour increases. The pons develops from which part of the primitive brain? Which of the following structures lies posteriorly to the pons? Which of the following cranial nerves does NOT originate from the pons?